Ry Rocklen, Rise, 2009, found mattress, fiberglass, Aqua-Resin, glue, glass tiles, grout, 44 x 46 1/2 x 38". Ry Rocklen has always had a soft spot for the worn and ripped, the flattened and deflated urban detritus he finds accumulated in thrift stores and cast off in back alleys. A found mattress, curtain, sweatshirt, and rubber ball receive a second life and are petrified as lavishly handcrafted aesthetic objects in “House of Return,” Rocklen’s current exhibition. 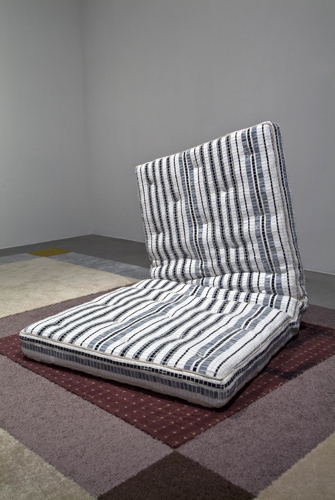 Rise, 2009, a mattress bent upright at the waist and meticulously inlaid with rows of glittering glass tile, stunningly conflates a cushioned heft with a hard, faceted surface. Bulging tummy folds humorously anthropomorphize the tilt of its slouching posture. At the opposite end of the gallery, a shredded white satin curtain worn with old age and too much sun is installed (with the help of a putty-covered armature) as a billowing structure of splayed, undulating ribbons, casting a twisting web of overlapping shadows onto the carpeted ground. But as much as Rocklen’s elaborate sculptural alterations to found objects revitalize the weary and return refuse from the brink of oblivion, they also scrutinize the contingencies of matter’s decomposition and express a sense of wonder at the accidental textures and forms to be discovered in states of decay. At their best, these works cover secondhand goods with new skins that reveal their latent character while hyperbolizing the potential Rocklen perceives when he encounters a damaged object on the sidewalk by chance.